This post has been a long time coming, and it’s something I’m pretty proud of! Before Waste Reduction Week in Canada (Oct 19-25) I wrote the first part of Project: Awareness; this is a project idea I had one night, which, if all went according to plan, would combine Waste Reduction Week, our growing community of the Zero Waste Bloggers Network, my English students, and one of our global problems: trash. First, I introduced Waste Reduction Week to the students; many were not even aware that this was “a thing”! We had group and class discussions about why awareness campaigns are important and what we can learn from them, specifically from environmental campaigns. I showed them an introduction video: Too Good To Waste, which showed how Calgary, Alberta, was taking on their trash problems, with an emphasis on composting. We took some polls of who in the class composted at home, and what we are doing to combat waste in our area. Secondly, we looked at various pictures of the largest landfills in the world, the Great Pacific Garbage Patch, and the most garbage-polluted areas; we discussed what this meant once our own town’s landfill reaches capacity. We also looked at a news article that declared Canada to be the country creating the most garbage out of all developed countries; how do we feel about that? Thirdly, I shared with them my major influential source that inspired me to strive for zero-waste living: The Clean-Bin Project. Each student was to record at least eight facts or “points of interest” that popped out to them. We spread the documentary out over two days; after each viewing we shared and discussed what stood out to us and other observations we made. Why did Jen & Grant start this project? List some changes they made to avoid producing waste (5 or more). What was one surprising fact in this film? How did it change your thinking? Now it was time for the fun part…include my connections to our Zero Waste Bloggers for an interactive interviewing session! Boy, oh boy, was I excited for this one! As a class we came up with ideas for “What makes a good interview question?” We decided they should be open-ended, and that they should get the interviewee to tell some kind of story. 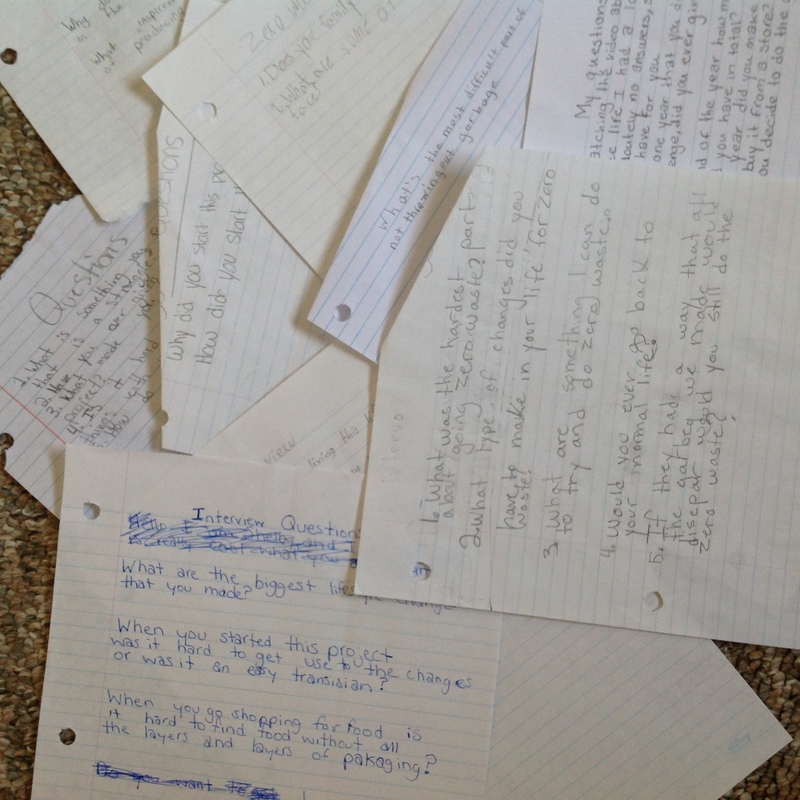 Students created two or more interview questions; not all would be answered, but I gave each blogger three questions to choose from. Using our Facebook group, I called for volunteers for this project and lots of people signed up: Lauren (Green With It), Bianca (Waste Free Me), Katelin & Tara (PAREdown), Kathryn (Going Zero Waste), Jack (We Talk Rubbish), Heidi (The Fallible Warrior), and Julien (Greener Family). Again, I am so grateful for all of you for helping us out! The kids were so excited when their question was answered! One by one, the video responses trickled in to our classroom; I’d state who we would hear from (name and their blog), and whose questions they decided to answer (some bloggers answered all three, which was great). We formed five small groups and each group had a paper with a topic on it. 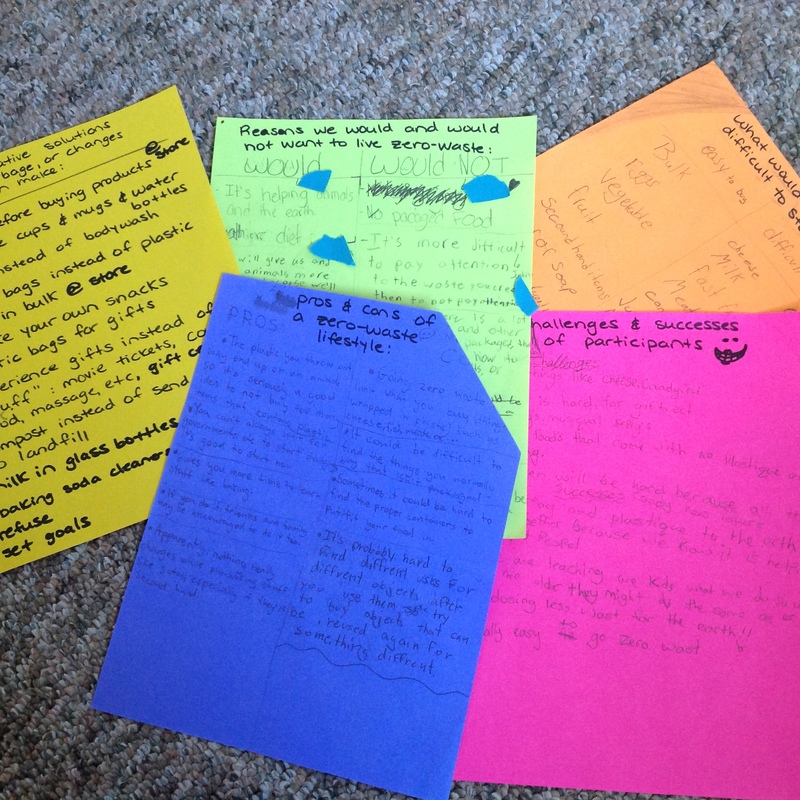 From the video responses and the other related work we had done, each group jotted down their thoughts and ideas. Once all the video had been viewed, each group presented their findings. I will now share some of these videos with you, with permission from the bloggers who created them, of course! This is Bianca from Waste Free Me; Bianca answered three questions in three different videos, so make sure to check those out! Some of the other videos would not upload for some reason, but I will try and figure that out. Stay tuned for more video responses from Green With It, Going Zero Waste, and The Fallible Warrior. It was also a challenge to answer the interview, specially in english 😉 By the way it was also a good way to put word on our initiative and actually find out what to say to other people ! Thank to you for this opportunity ! What a fantastic project to do with your class. Part of the problem of waste is that people just don’t think about it, communicating these ideas to the future trash makers is a great way of getting people thinking. Also great for the students to see that normal people are doing awesome things and have made it part of their lives. Makes it all seem so much more like something they could try. Yes! One of my students pointed out that it is a lot easier for people to just not think about it and continue wasting as they were, which led us to the discussion of the phrase “ignorance is bliss”. Very true though! I was very excited they made that connection. Honoured to have played a small part in this project! 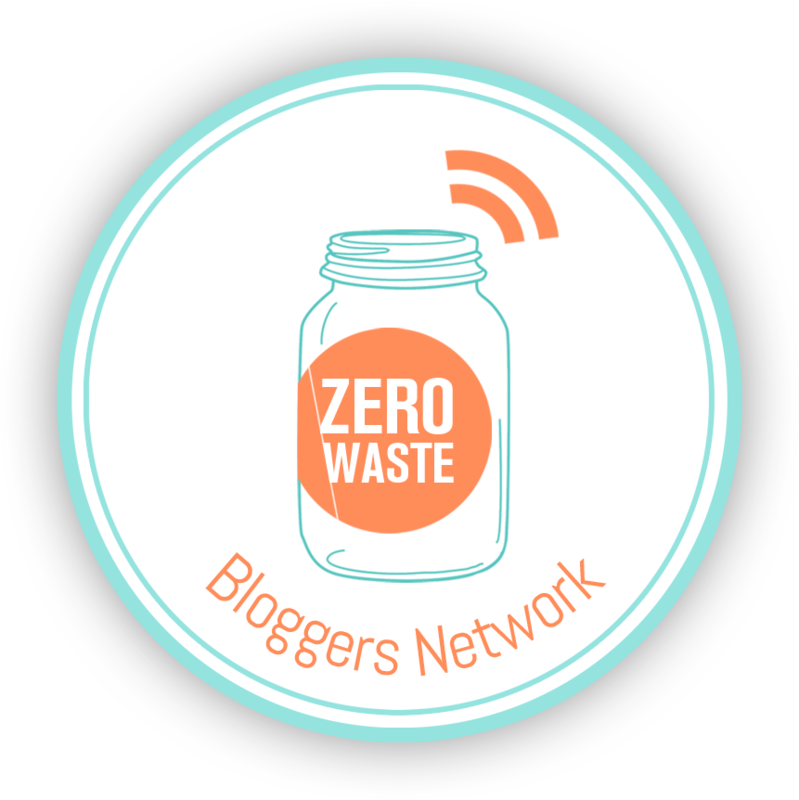 And pleased to hear about all these other zero waste bloggers too! My blog has fallen to the wayside a bit, but I am still on the zero waste path. Well done! What a great project. I don’t think you can underestimate the importance of raising awareness, whether it’s shopkeepers, family, friends, school children etc. What age group were these kids? Grade 7, so mostly 12 years old.